Posted in Snapshot and tagged ANZAC day, Birkdale Landfill, Glossy Black-Cockatoo, Redlands Home Assist Secure, what's on. Posted in Environment and tagged Glossy Black-Cockatoo. Posted in Environment and tagged Glossy Black-Cockatoo, IndigiScapes, volunteers. 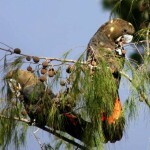 Posted in Environment and tagged Glossy Black-Cockatoo, IndigiScapes.